I entered a challenge to produce one piece of jewellery (jewelry) each week for 2013. Here is my entry for week 1. 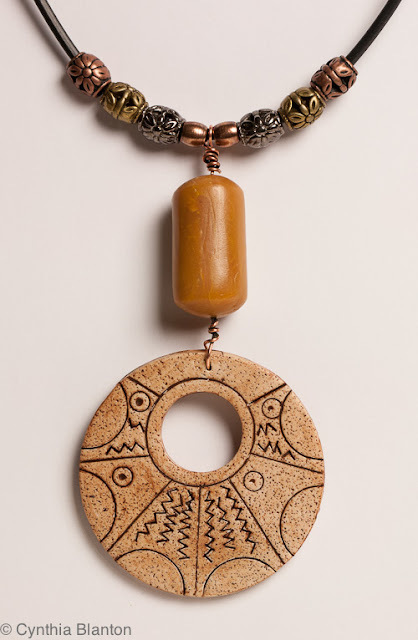 The disk and "stone" are made from polymer clay, but the beads on the cord are metal. I made the design on the disk using cutters and a small screwdriver while the clay was raw and then antiqued it after baking. Love it! Can't wait to see the next 51! You did a great job selecting beads and colors. Good job! Is the challenge a personal one or is this linked to a certain blog or website? I'm looking for a project to do this coming year but would like to be part of a group challenge. The challenge is for a Facebook group called The Year of Jewelry Project. Just search on Facebook for it and then ask to join the group. The first item is due Jan 5 so there is still time to join.